In this tutorial I will go through the process of multishotting. If you did not know, the basics of multishotting is basically molding a resin of one color into a resin of another color. This ensures a much better quality than for example painting, and is also one of the biggest challanges with casting! In this guide I'll show you the process of casting my Orxplorer cap! (For a look at the sculpting of this cap, check out • Sculpting with Super Sculpey: "The Orxplorer"). For small multi-shots, you want to use something with a pointy edge! For this guide, I personally toothpicks; many other makers prefer to use pointy tipped syringes to be able to control the ammount of resin on the tip! Just be very careful so that you don't spill, if you apply to much it might flow over. The cast is not ruined if you spill though, just wait for the resin to start to set a little, and then remove the spill with a toothpick when it is more viscous! 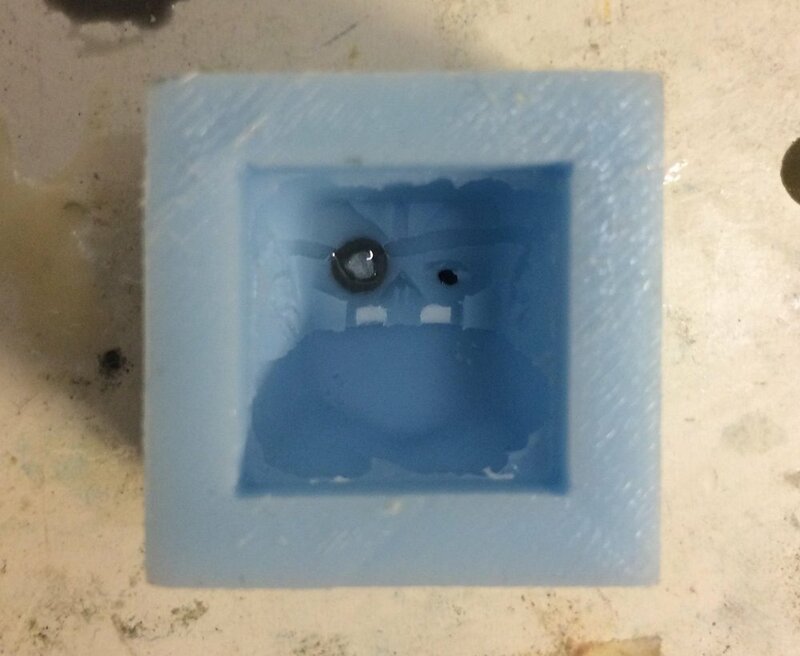 The third shot is cold-casted aluminium for the glass-eye. This is then polished after demolding to give it a shimmer like that of real metall! The fourth shot is brown for the leather strap. Multishotting up walls is a little trickier than just straight down, and requiers you to either add some material that increases visciosity, or waiting until it has started to set a little. Once it is not as runny any more, you can just apply it up the walls, and it will stick there until it has dried! For this one I had to mix orange with chestnut to get the prefered color. Mixing and experimenting with colors is very important to get the correct look you're out for! The last shot is green for the whole rest of the cap! Something that is worth thinking about is that different types of resin might not stick to eachother/ form weak bonds, so look into that beforehands to make sure the finished cast comes out good! For any other questions or suggestions of what I should add to the tutorials, feel free to send me a message! Hope you learned something new!